"The Franklin School, as it stands, was built in 1902 on Nahant Street. Plans for a new Junction school house began in 1900 when an article was introduced at the May 21st Town Meeting. A committee of five townspeople (School Committee member G.H.S. Driver, Thomas E. Dwyer, Augustus D. Jenkins, Thomas Hickey, and F.O. Clark) was selected to review whether an eight-room school house should be built. They were to make their report without exceeding $100 to procure the plans. In November, 1900, the committee reported back that 'it was inexpedient to make any additions to the present building (then on Franklin Street) as plumbing and heating of the old and new building would not only be expensive, but would make the building unsatisfactory.' The May, 1901, Town Meeting voted to purchase, or take by eminent domain, land on the northwest corner of Nahant and Traverse Streets for that purpose, and to erect an eight-room brick school house, according to the plans drawn by Harland A. Perkins. Some disagreed with the location, based on the costs of removing ledge on the Traverse Street side ($2 per square yard to cut away) and the filling of the bog in the rear (48 cents a square yard to fill). The land was taken in 1901, with construction starting immediately at a cost of $30,000. A sum of $1,000 was appropriated by Town Meeting to furnish the school, which later bought only 42 desks and chairs for five rooms, for a total of 210 seats. 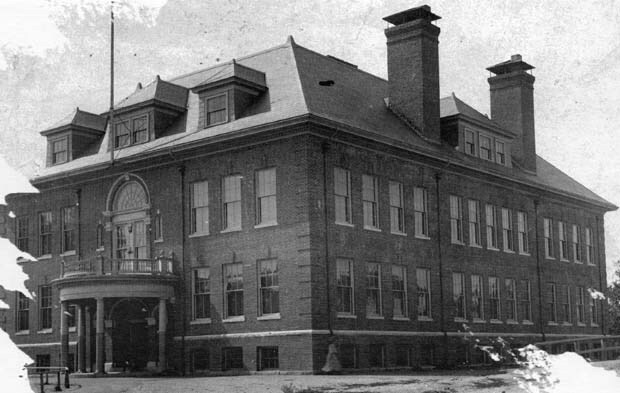 When school opened on September 8, 1902, approximately 240 students were on hand. A sixth classroom was quickly assembled with furnishings from other schools and districts. The building was enlarged in 1926 which doubled its room capacity." -- Text from calendar by Jayne M. D'Onofrio. “Franklin School, circa 1922,” NOBLE Digital Heritage, accessed April 22, 2019, https://digitalheritage.noblenet.org/noble/items/show/6949.